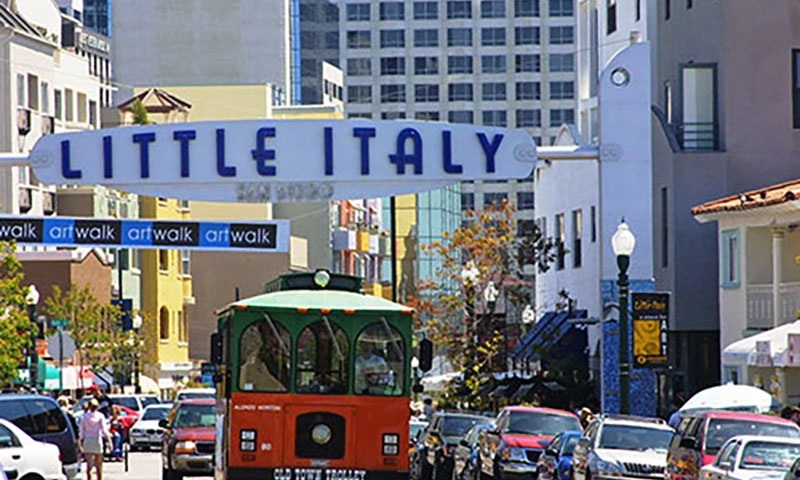 Little Italy is a hidden local gem in Downtown San Diego. This hip and historic neighborhood is packed with patio cafés, fantastic restaurants, craft brew stops, urban wineries, art galleries, sophisticated shops, boutique hotels and the beautiful Amici Park. Little Italy was once a fishing neighborhood home to generations of Italian families that made a living in a flourishing tuna fishing industry. The first large tuna cannery, the Pacific Tuna Canning Company, was founded in 1911 and employed over 1,000 immigrant fisherman from the Portuguese Azores and Italy, who’s influence is still felt here. Today, the renovated–active and vibrant neighborhood is San Diego’s most dynamic food and drink scene. Little Italy is filled with patio cafés, packed restaurants, craft brew stops, urban wineries, art galleries, sophisticated shops, boutique hotels and the beautiful Amici Park. A “Tunaman’s Memorial” statue located on Shelter Island and a sculpture standing in Barrio Logan are both dedicated to the cannery workers. The population of Little Italy is 5000. The compact area of Little Italy features mostly condominiums, townhouses and very few homes for sale. 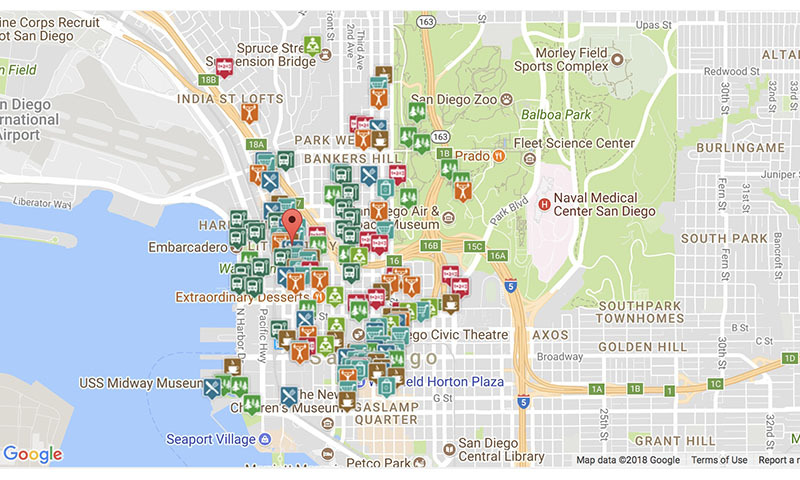 All with a prime central down town San Diego location, often with beautiful views. Properties for sale in Little Italy are all within walking distance to shops, award winning restaurants, parks, and the farmers market. To the north of of Little Italy you’ll find a less densely populated area compared to the south. Which is primarily made up of high-rise and mid-rise buildings. A few older buildings have been restored and renovated to maintain its original feel to be utilized for modern living. The main street (India Street), is the commercial corridor that runs through heart of Little Italy. 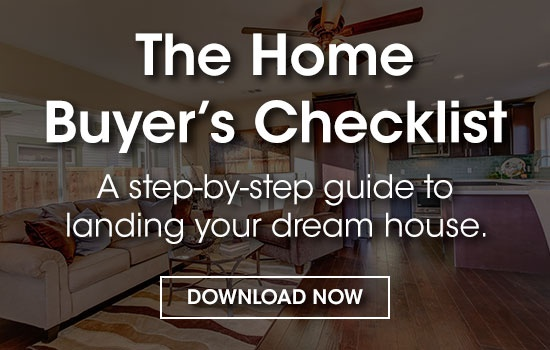 It’s intermingled with high-density mixed-use buildings and single-family bungalow style historic properties all within a walkable 48 square block area. 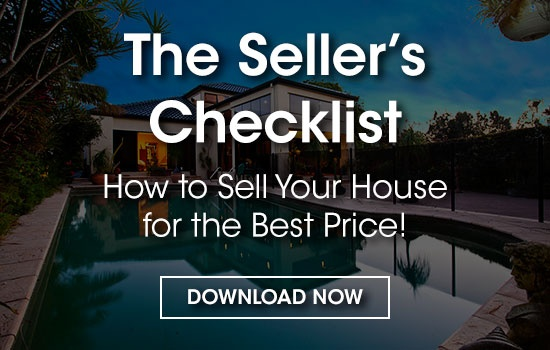 Real Estate prices in Little Italy have been increasing year after year like the rest of San Diego. As of April 2018, The Median Home Value in Little Italy is $591,000 as per Zillow.com. 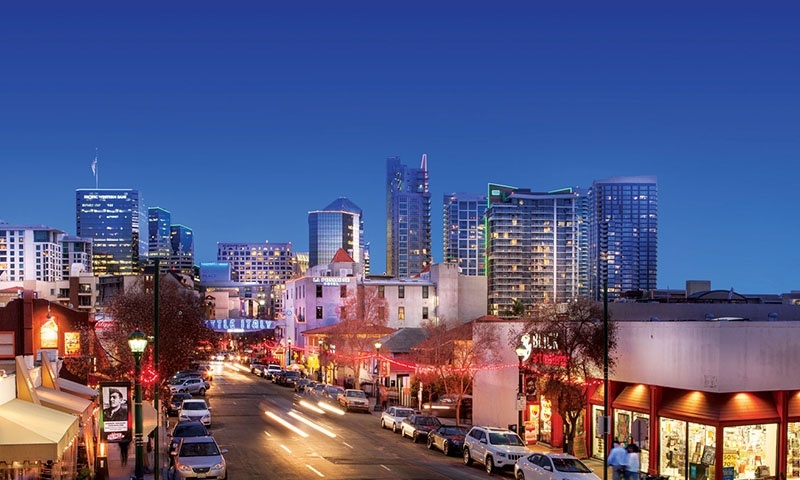 Demand for property in Little Italy is high but inventory is low. It's not quite an ocean view, but it's the next best thing; there are quite a few properties in this neighborhood that overlook the beautiful bay. 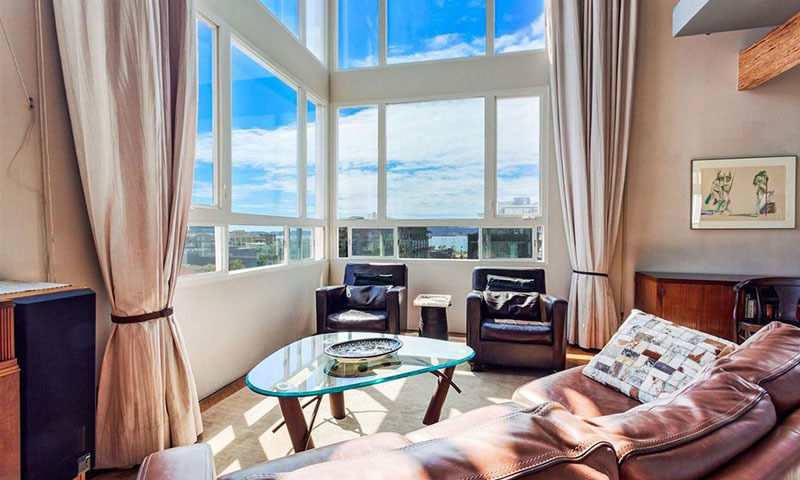 Couples are thrilled to find that balconied bedrooms are featured in many of the properties in Little Italy; perfect for a romantic spot to watch sunrise or sunset. Many complexes in Little Italy have a swimming pools so you can enjoy parties with your family and friends all summer long. If shopping is your thing, there are plenty of shops, art galleries and boutique stores in Little Italy which make it a great place to enjoy a day out. If you are into the arts, you're in luck with the number of venues such as music halls, museums and cinemas here displaying ever-changing exhibits and productions. If you have always wanted to live close to an area that boasts great activities to keep you busy and active, Little Italy is the place to be. Little Italy is known for its trendy cocktail bars, brewpubs and restaurants with bustling patios. The neighborhood also features many upscale clothing boutiques, indie music venues and quaint piazzas that dot the area. The weekly Little Italy Mercato Farmers’ Market draws crowds to its mix of produce, gourmet food and craft stalls as well. The community of Little Italy also has its own Business Improvement District and Community Benefit District that’s maintained by the Littaly Italy Association which was established in 1995 to oversee the revitalization and beautification of Little Italy. This association represents residents, property owners, and businesses of Little Italy. There is also an Italian Cultural Center that has over 600 members for anyone interested in Italian culture and language located within the neighborhood. It’s goal is to promote Italian culture in all its varied form. 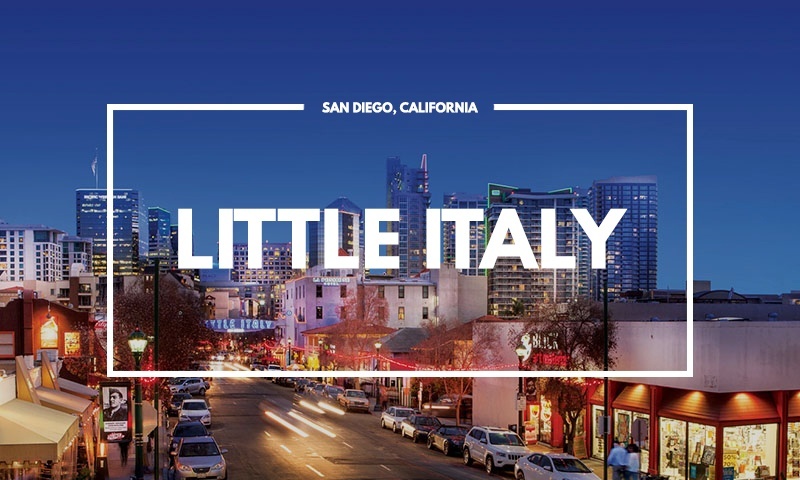 The Convivio Center & Little Italy Heritage Museum is Little Italy's newest destination for arts, culture, heritage and all things Italian in San Diego. The Center serves as a community resource and provides programs and events and something for everyone. Little Italy has some of the best Italian Restaurants you will find anywhere. 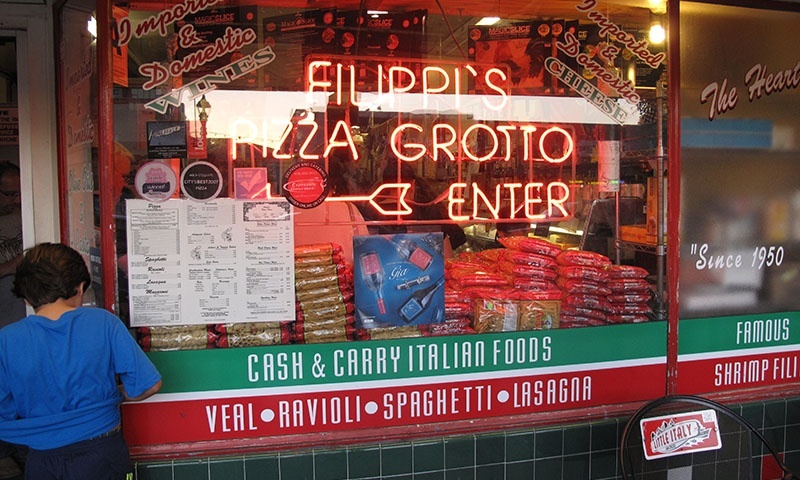 India Street is lined with restaurants featuring cuisines of both Southern and Northern Italy, including the classic Filippi's Pizza Grotto, featuring an old-fashioned Italian dining experience along with a delicatessen and market, which offers everything from prosciutto to mascarpone. You can also stop by the markets that specialize in Italian groceries. It’s where top chefs and local brewers have set up shop. A slew of luminary chefs have gravitated to Kettner Boulevard, giving it the title of “Top Chef Alley" with distinctive eateries including Bracero, Juniper & Ivy, The Crack Shack, Herb & Wood and Kettner Exchange. 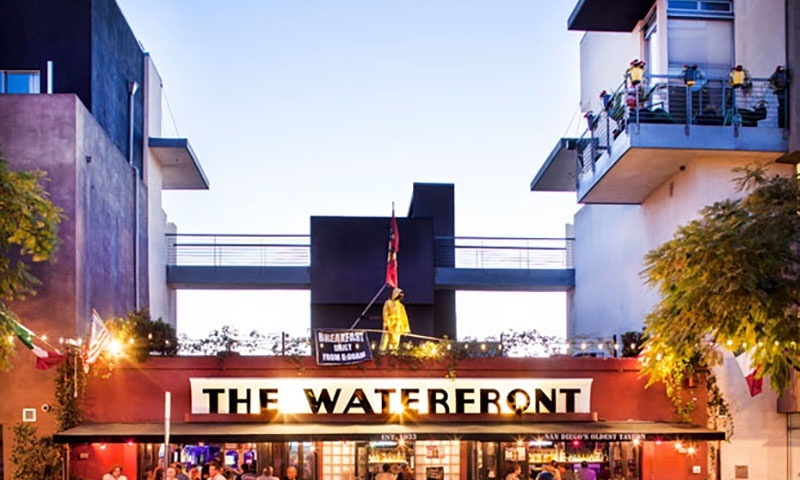 Since 1934, the Waterfront Bar & Grill has been a favorite local watering hole serving locally brewed ales and burgers. And the British, owned and operated Princess Pub and Grille serves British and Irish beers, along with traditional pub fare such as fish and chips for patrons watching soccer and rugby via satellite TV. 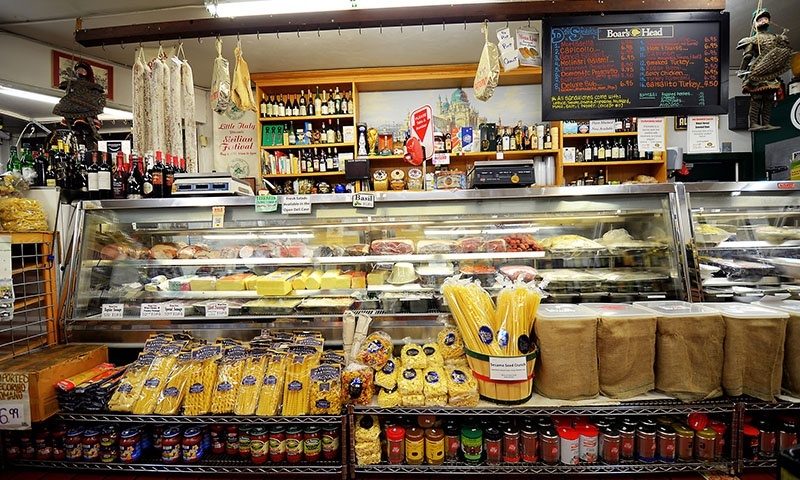 No Little Italy would be complete without a true Italian market and Mona Lisa Italian Foods deli fits the bill. The deli offers a selection of foods, wine and delicious deli sandwiches. Little Italy also features some great local boutiques including The Shopaholics Boutique, Rosa Mariposa, Vocabulary Boutique and Melero Boutique & Gallery where you can find unique clothing, jewelry and small craft items, and the Kettner Art & Design District which encompasses a group of retail shops and art galleries. The French Garden Shoppe and Architectural Salvage are both worth a visit for home goods and unusual finds. And each Saturday from 8:00 AM until 2:00 PM, several blocks of Little Italy are shut down for the weekly Little Italy Mercato. Beyond food, shopping, and entertainment–Little Italy also offers a few parks which includes Waterfront, Amici and Little Italy Dog Park. The community is also home to Washington Elementary school (the oldest elementary school in Downtown San Diego), which has received great reviews from parents in the area (it’s located near Amici Park). Getting to Little Italy is easy. The aroma of fresh baked bread and Italian seasonings should be enough to get you close to Little Italy. 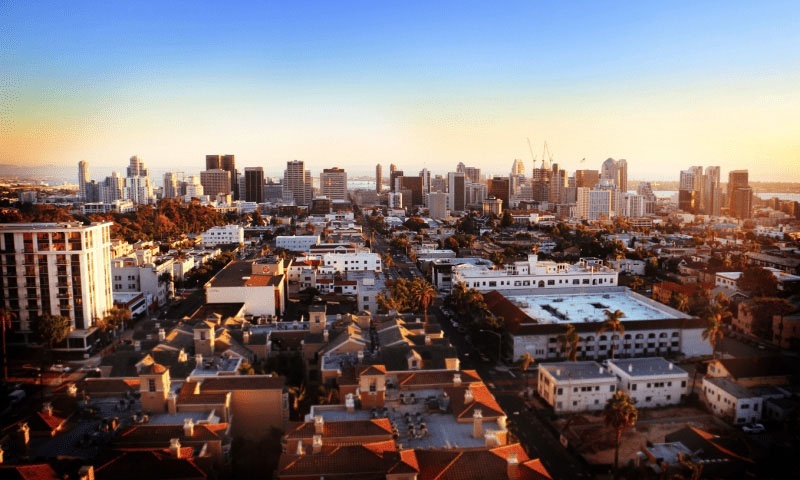 But on a more practical sense, Little Italy is nestled between the downtown core and San Diego's glistening waterfront. If you're arriving from the North, exit on Front Street, and immediately turn right on Cedar. From the airport, take Harbor Drive to Grape Street (turn left) - you're in the center of Italian cuisine bliss. You could walk from downtown, or grab a pedi-cab for a romantic ride to your favorite Italian spot, however you get there, save room for cannolis. Mangia! The majority of things to see and do in Little Italy revolve around its Italian culture. 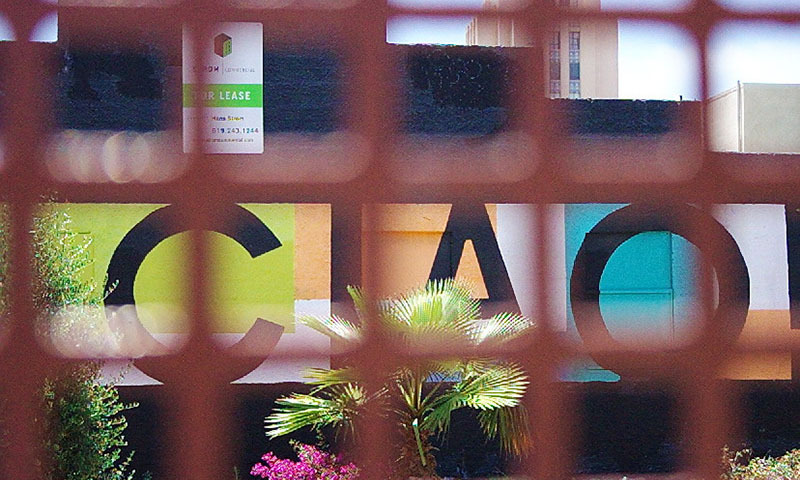 Every Saturday, 8:00am – 2:00pm, on W. Cedar Street is where you’ll find the Little Italy Mercato. This Italian farmers' market features freshly caught fish, vegetables and fruit from local farmers, pastries from local bakeries, flowers and plants from local farms, and art from local artists. 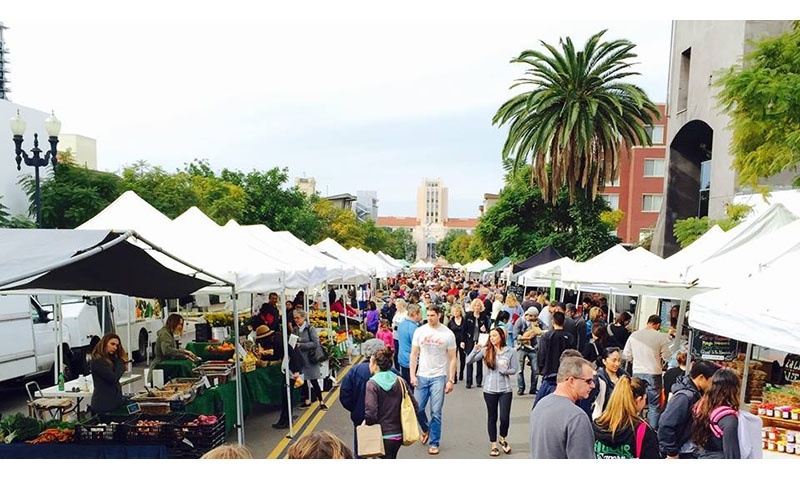 This is (in our opinion) one of the best famers markets in San Diego. It's quite large and if you do stop by, make sure you go hungry because you will find it hard to resist all the samples you can grab from the many local stands! The Saturday before Mardi Gras, there is the Little Italy Carnevale, a Venetian mask event with several vignettes of entertainment and an open house for retail shops and restaurants. In April, there is ArtWalk and the Gran Fondo (Big Ride) Colnago San Diego. ArtWalk is the largest art event in the west coast with over 120,000 people coming to purchase various mediums of art - paintings, photography, jewelry, furniture and more. The Big Ride is has over 3,000 bicycle riders from all over the world come to ride throughout "America's Finest City" in a 32, 53 or 100 mile ride that starts under the Little Italy landmark sign. In May you’ll find the Sicilian Festival. It features Italian and Sicilian entertainment, a cultural pavilion highlighting the contributions of the Italians of San Diego, vendors, and Sicilian cuisine. In spring you’ll find the Taste of Little Italy, where you can pay to sample food from over 20 participating restaurants and enjoy entertainment throughout the community. September hosts the Labor Day Stickball Tournament where stickball leagues come together and play on the streets of Little Italy. It’s a time honoured east coast game similar to baseball. 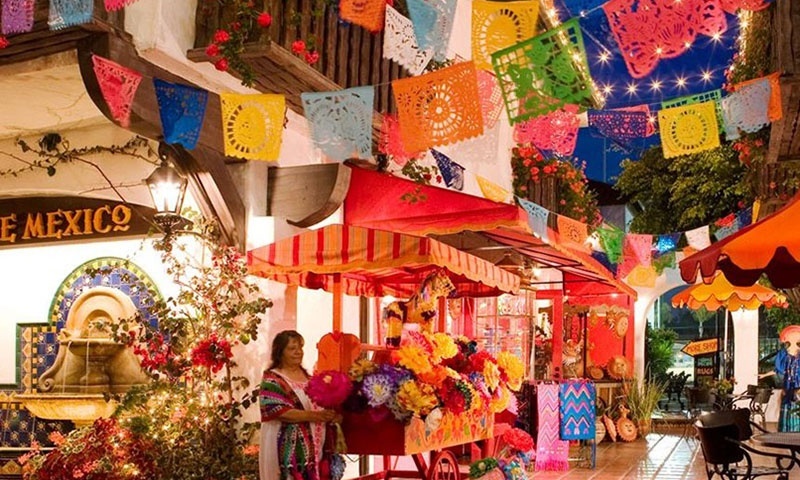 October is the Little Italy Festa–the largest Italian festival outside of New York City. This is where you’ll find over 150 Italian food and crafter booths, three stages of entertainment, the Gesso Italiano Street Painting Festival, and a stickball exhibition game. Later in October you’ll also find the Bulls of St. Agata Charge Little Italy. An event that showcases over 50 Lamborghinis from all over the States. Last but not least in December is where you’ll find the Little Italy Christmas Village and Tree Lighting. An event that has Santa Claus riding in on Little Italy Fire Engine #3, a kick-off to the festivities music, shopping and bubbly snow flakes for the kids. 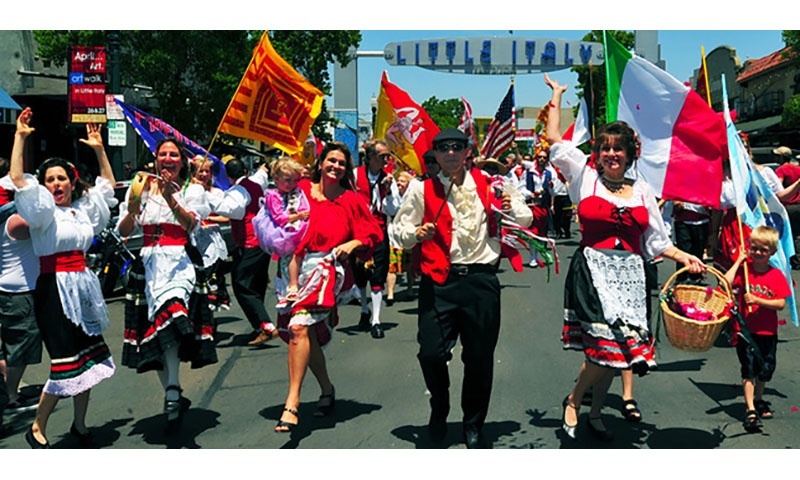 Little Italy San Diego is also known for several fun festivals including Little Italy Festa! each fall and the Mission Federal Art Walk each Spring. The neighborhood also showcases a life-sized gingerbread house all month long at Queenstown Public House (New Zealand inspired restaurant), which collects toy donations for local charities around the area each year. Piazza Basilone – A permanent public space dedicated to honor Sgt. John Basilone. San Diego Firehouse Museum – Founded in 1962, the firehouse resides at First Avenue and B Street at the City Operations Building. 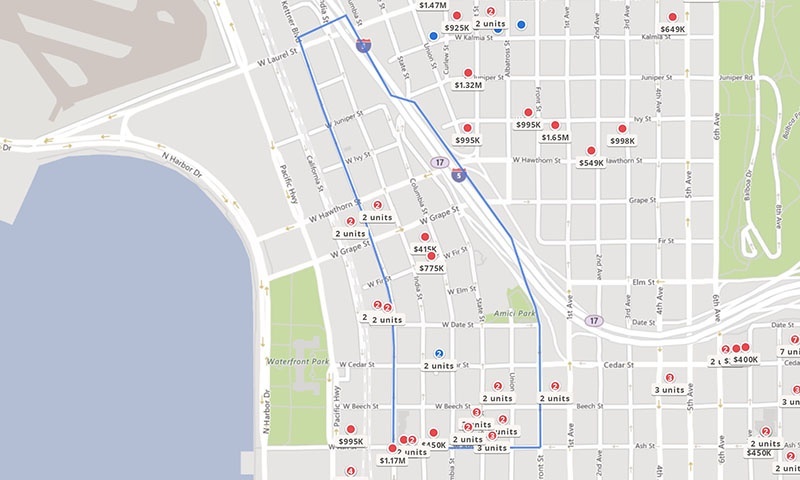 One-Mile Walk – Tour around Little Italy. The One-Mile Walk was created to give visitors a workout regiment that does not cross any intersections or stop lights. Embarcadero – Located along the harbor on the east side of San Diego Bay, the Embarcadero is home to the San Diego Cruise Ship Terminal, the USS Midway, Navy Pier, the Star of India, and the San Diego Maritime Museum. 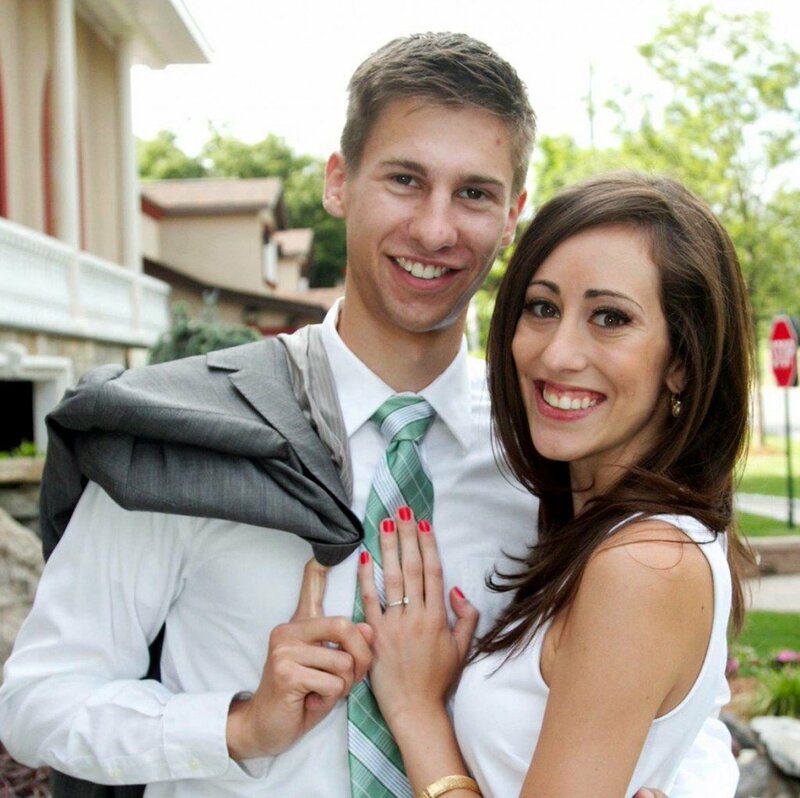 Little Italy is a genuine Italian neighborhood that’s popular for singles. It's the place to be If you're a foodie and love delicious cuisine, such as Italian, Mexican and gastropubs. You’ll never go hungry here. The area's lower crime rate makes it safe to walk, live and work. This pedestrian-friendly neighborhood offers plenty to see, eat and do. 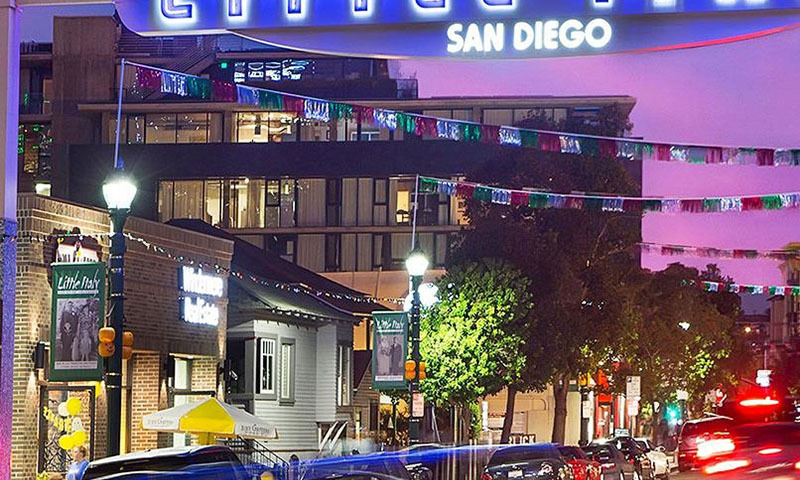 Little Italy’s downtown location offers quick and easy access to all of San Diego’s hot spots. This makes it a prime area to live for anyone wanting to be close to downtown San Diego.